James Giroudon was born in La Tour du Pin, not far from Lyon. He studied art history, sociology and education sciences at the Université de Lyon, and is a graduate of Pierre Schaeffer and Guy Reibel’s class at the CNSM in Paris. From 1982 to 1990 he taught at the ENM in Saint-Etienne, where he set up an electroacoustic music section, and in 1992 he was appointed to the « Arts du Spectacle » degree course at the Université de Caen. It was in 1981 that he and Pierre-Alain Jaffrennou founded Grame, and since then he has been its co-director. 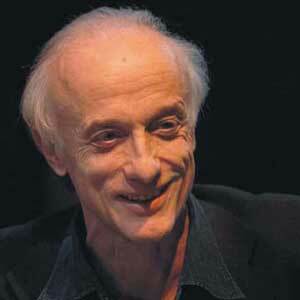 In 1992, in Lyon, he created the Musiques en Scène festival, which in 2002 became a biennial. Since 1998, he has been Thierry Raspail’s fellow curator of the Musiques en Scène audio art exhibition at Lyon’s Musée d’Art Contemporain. He was also invited to curate the 2000 Belluard festival in Fribourg, organizes the monographic exhibition of Peter Bosch and Simone Simons (2009/La Tour du Pin) and the exhibition « Mobilité, sons et formes » to Taipei Fine arts Museum (2010). Since September 2001, he has been contributing a « contemporary musics » column to the Bloc Notes de la Mapra (Maison des Arts Plastiques Rhône-Alpes). 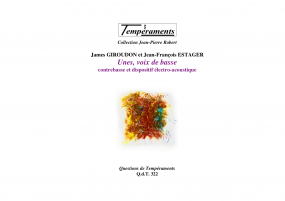 James Giroudon composes electroacoustic music for concerts and large-scale musical events, as well as mixed works for soloists, instrumental groups and electronics systems. He has also written music for the theatre. His works have been premiered by ensembles such as Aleph, TM+, 2e2m, Archaeus (Bucharest), Alter Ego (Rome), the Neue VocalSolisten of Stuttgart, the Solistes de Lyon-Bernard Tétu, the Percussions Claviers de Lyon and the Ensemble Orchestral Contemporain, as well as by soloistes including Jean-Pierre Robert, Maurizio Barbetti, Elizabeth Grard and Daniel Kientzy, Jérémie Siot, Yi-Ping Yang… His works are regularly played outside France, in Grame’s concert tours and at festivals, notably in Europe and Canada. In 1989 he received the Prix de l’Académie du Disque Français for a record produced jointly with Musiques Numériques, and in 1993 the Faust de Bronze for the opera Jumelles, co-written with Pierre-Alain Jaffrennou. Several of his pieces have been recorded and released by Editions Forlane (MFA collection), ECM, the Nova Musica label and ÄmeSon. He continues to work with the composer Jean François Estager on co-writing, along the lines of mixed forms combining instrumental material with sounds and electronics. Receives in 2009 a commission from Forum Music (Taipei) for a new piece with chinese orchestra, percussions and electronics, in 2013 a commission from BorusanMusik (Istanbul) for a new scenographic music with the solist Yi Ping Yang.